Ahead of his current contract expiring next summer, the agent of Chelsea midfielder Cesc Fabregas has reportedly held further talks with AC Milan. 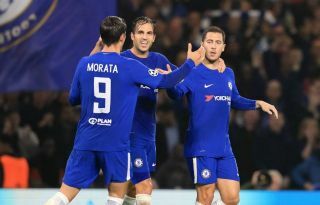 The 31-year-old looks set to move on from Stamford Bridge next summer when his contract runs down, as there has been no public suggestion that he will pen a renewal. Given he’s been restricted to just 10 appearances in all competitions so far this season having fallen down the pecking order under Maurizio Sarri, an exit would perhaps suit all parties. With that in mind, MilanNews.it editor Antonio Vitiello has reported that fresh talks were held between the Spaniard’s agent and Milan officials on Monday with negotiations ongoing to reach an agreement on personal terms, as per his tweet below. That seemingly suggests that it could involve a January exit from Chelsea as he touts a two-and-a-half year deal being put on the table, albeit it’s added that the two parties are still some way off reaching an agreement. Nevertheless, a January exit would be beneficial to Milan given their current injury crisis, with Lucas Biglia ruled out until next year while Giacomo Bonaventura isn’t expected back until next season as he prepares to undergo knee surgery. In turn, Gennaro Gattuso will likely be itching to bring in midfield reinforcements in January, and Fabregas could fit the bill given his experience, leadership and quality. As noted by Sky Sport Italia, Lucas Paqueta is set to arrive from Flamengo in a €35m deal to bolster the midfield too, and so along with Fabregas, they could be crucial additions in the second half of the campaign to help Milan maintain their push to qualify for the Champions League. The Rossoneri moved up into fourth place this past weekend, and with the potential signing of Fabregas in January, it would surely give them a major lift in their pursuit of a seat at Europe’s top table.